Cost to install a garage door. Prices for garage doors replacement. Cost of garage door installation varies from $240 to $950 for labor or from $530 to $3,350 including cost of 8' x 7' door and materials expenses. Garage door size, materials used for door manufacturing and type of garage door are main factors which will determine the total cost to get a new garage door installed. 1 All prices in the chart are for a standard 8’ x 7’ sectional garage door and basic installation. Twice wider (16’ x 7’) door will cost 60% - 70% more and labor expenses will increase up to 40%. Installation of garage doors which are higher than 7’ will be priced at higher rates as well. 2 Garage door prices estimated as an average amount will be added to the total cost if a contractor will purchase a standard door at his own discretion. This expense will be omitted from the estimate if a homeowner has its own preference and will provide the door. 3 Cost of labor calculated as a charge for basic work complexity including installation of new track hangers, tracks, torsion springs, garage door opener (excluding programming remote controls) and door trims installation if necessary. Cost of labor is a standard fee for installation, not a garage door replacement. 4 Difference in cost reflects average savings or additional expenditures in percent equivalent for particular garage doors installation in comparison with a steel door. What are extra charges for garage door replacement? Removal and hauling away an old garage door will increase the cost of labor up to 20%. Any extra work including resizing rough opening, replacing rotten wood, reframing or building additional supports will be quoted separately. Garage door repair will be prices after the door inspection and defining what has to be done. Expect to pay minimum fee for small repair which might vary from $160 to $200 depending on location and installer’s hourly rates. How much does it cost to insulate garage door? Cost of materials will vary from $110 for 8’ x 7’ door using single foil white vinyl insulation with R3 insulation value to $320 or even more for insulating 16’ x 10” garage door and purchasing better quality insulation with R9 or higher insulation value. If an installer will be hired to perform the work, additional $150 - $190 will be charged for labor. Prices for side-hinged garage doors will vary from $370 to $6,500 and some custom designed doors can cost even more. Side hinged garage door prices will be determined by materials the door was made of and its actual dimensions. Aluminum door typically is the least expensive option whereas an equivalent in size door made of wood normally can be purchased at a few times higher price. Cost of labor for standard installation will vary from $350 to $700, but labor expenses might go up for any additional work. 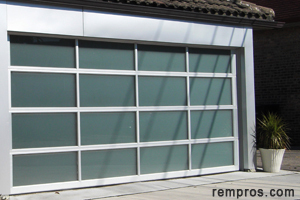 Roll up garage door is one of the cheapest options. Prices for a standard 8’x7’ door start from $190 and adding $180 - $230 for installation the total cost will come up to $370 - $420 to get it installed. But regardless of low prices roll up garage doors are less popular options for residential properties comparing to sectional and side-hinged doors. How much did you pay for garage door?